I believe that the owner of this station was Alphonse Condon and the station was located around the Palafox-Garden St. area, maybe across from the old Catholic High School. Hope this may jog someone’s memory that will know more about this. I agree. When I saw this, I thought it looked like the building just to the west of Baylen St. I think it was converted into the tax assessor’s office. 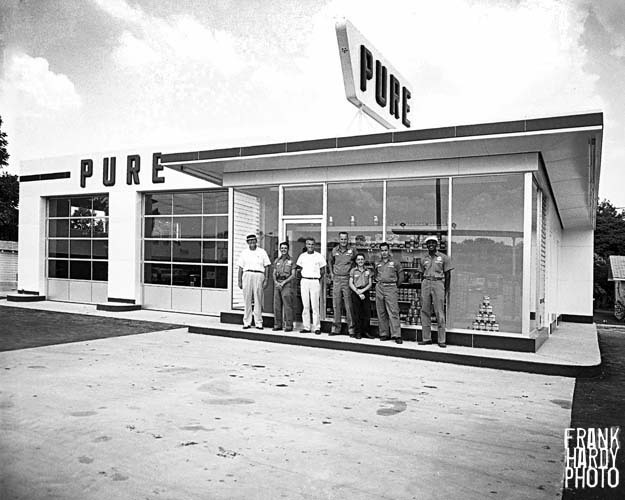 Do you have any pictures of the Fowler Butane Gas Company store? It was located at first on Wright street, then they later moved, not sure where, maybe Pace blvd. I was married to Bill Fowler and our kids would enjoy seeing any pictures you might have. Thanks! I BELIEVE THAT STATION IS ON CERVANTES IN EPH! fought against it. Told me it was a “Hazard to navigation” Your red and white boat was docked in the first row closest to the parking lot. Hope all is well, Frank. Just a thought, but this really reminds of the old gas station in Cantonment at the corner of hwy 29 and Muscogee (directly across the street from Champion golf course). I remember it being a BP fill and light service station, and then it went under in (i think) about 1998 –	2000. It was torn down and is now a raceway. I remember the look of the building well and this has got to be it. My grandfather lived in cantonment then, I’ll find out if it was originally a pure station and get back to you. Pete Ueslbeck owned that station that was started by his dad. Mr Pete used to race at the old Pensacola Speedway in the Rainbow 8 car. His son, Charlie was a good friend of mine. When Mr Pete’s dad started the station Hwy 29 was a dirt road then.